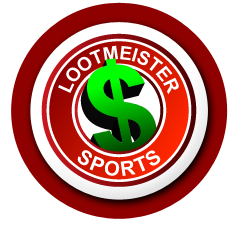 Welcome to Lootmeister's free MLB picks page where you'll find daily baseball betting predictions with analysis each day of the Major League League baseball season. The professional baseball season is a grind to say the least, stemming from the beginning of April and into October. With so many games on tap, we hold the advantage as we're able to pick and choose our spots, utilizing short underdogs to turn a profit. The beauty of wagering on underdogs is that you can hit less than 50% of your MLB picks and still turn a profit, due to the moneyline paying out more than your risked amount. Please bookmark this page and check back daily for our current predictions. We highly recommend betting each pick, regardless of your personal opinion of the game. We will grind out a profit at season's end! You can bet on it! Please always protect yourself by betting on baseball using "Listed Pitchers". Lastly, check out our left menu which has tons of articles offering tips, strategy and betting advice! Sunday, March 31st: SF Giants/SD Padres UNDER 7.5 (won 3-1). Saturday, March 30th: Astros/Rays UNDER 7.5 +100 (won 3-1). Thursday, March 28th: Chicago White Sox -190 (lost 4-12). Sunday, World Series Game 5: Passing. Saturday World Series Game 4 Pick: Los Angeles Dodgers -165. I'm expecting Boston to come out flat after an extra winnings road loss in the World Series. Friday World Series Game 3 Pick: Boston Red Sox/Los Angeles Dodgers OVER 7.5 runs. 10/20/18: Milwaukee Brewers. I think we see a ton of Josh Hader tonight. Buehler is good, but a rookie. It's just not in the cards for the Dodgers tonight. 10/19/18: Milwaukee Brewers -103. Miley hasn't given up ANYTHING vs. L.A. all season. No reason to think anything changes tonight. 10/18/18: Sorry for the late post! It's a few minutes until first pitch. I'm making a lunch money play on the Houston Astros at -185. The value is dampened by the fact the 'Stros have lost 3 in a row. Take it tiny if you do happen to bet it! 10/13/18; Milwaukee Brewers +115 and Houston Astros +108. 10/10 and 10/11: No games scheduled. 10/9/18: Wasn't expecting the Red Sox to put up Coors Field numbers last night. Crazy! I'm taking a pass today as I have no feel for today's game. 10/8/18: Red Sox/Yankees UNDER 8.5. Expecting 5 runs or less in this one! 10/7/18: My apologies for forgetting to post that we were passing today! 10/6/18: New York Yankees +100. David Price has given up 9 dongs in 15.2 innings to the Yankees this year. He also tends to choke out in big spots. 10/5/18: Milwaukee Brewers -160. The Rockies hae scored 2 runs in 4 of their last 5 games. It appears as if they peaked too early and are coming back to earth. 10/3/18: The A's are throwing a bullpen game today so it's anybody's guess which pitchers will be on the hill and for how long. The pitcher is so huge in MLB, that now knowing who will pitch makes this game unbetable. 10/2/18: I don't have a take on today's Rockies/Cubs game so have to pass. 10/1/18: I really wanted to play both underdogs today but am going to pass. Both have a shot, but the fact that both road teams played yesterday and had to travel, then play a day game makes this an unbetable proposition. 9/28/18: Sticking with the hot hand here: Rockies -180. 9/27/18: Colorado Rockies -172. The Phillies have scored a combined total of 5 runs and 3 of those games were at Coors! Rockies have scored double digits in 3 straight. Arieta not throwing well lately. 9/25/18: San Diego Padres -105. 9/20/18: Miami Marlins on the run line at +1.5. 9/17/18: Giants/Padres UNDER 7.5 runs. 9/16/18: Passing to give full attention to NFL. 9/14/18: Minnesota Twins/Kansas City Royals UNDER 8.5. 9/13/18: I mulled over every game side/total and couldn't find one single edge so we have to pass today. 9/10/18: Chicago White Sox/Kansas City Royals UNDER 8.5. 9/8/18: San Francisco Giants +1.5 -120. Gio had a sh*t August and hasn't pitched well at Miller Park (historically). Stratton has been pitching very well. Nice value here! 9/6/18: Today's four game MLB card doesn't offer any value so we're forced to pass. 9/5/18: Cincinnati Reds/Pittsburgh Pirates UNDER 9 runs. As bad as Homer Bailey has pitched this season, he comes to life in September as his career stats are 15-8. He also has pitched well at PNC Park with a 2.83 ERA over 70 innings. Taillon is on fire and I'm forecasting him to give up no more than 2 runs. I see less than 5 runs scored in tonight's game. 9/4/18: My apologies. I forgot to circle back a round and update. Be glad you missed it! We'd have lost! 9/3/18: Chicago Cubs/Milwaukee Brewers UNDER 9 (-120) @ 5Dimes. 9/2/18: New York Mets -130. The Giants have scored 1 run in three of their last four games. Enough said! 9/1/18: San Diego Padres +1.5 (-130). 8/31/18: Pittsburgh Pirates/Atlanta Braves UNDER 8 runs. 8/30/18: Colorado Rockies -148. Marquez has been dealing lately (3 earned runs allowed over last 21 innings). Today he faces a Padres team that strikes out a ton. Rockies -148! 8/28/18: St. Louis Cardinals -160. 8/23/18: Detroit Tigers on the run line +1.5 +100. 8/20/18: New York Mets -117. 8/19/18: Got a late start and can't properly handicap today's games so am passing. Kinda like the Phillies on the runline, but lunch money only! 8/18/18: San Francisco Giants -155. 8/17/18: St. Louis Cardinals -120. 8/16/18: Colorado Rockies/Atlanta Braves UNDER 8.5. 8/15/18: Atlanta Braves -230. I sure hate laying this much chalk, but I really don't see any way the Braves don't clean up here. 8/10/18: Toronto Blue Jays +101. 8/9/18: Boston Red Sox/Toronto Blue Jays UNDER 9.5. 8/2/18: Early game! Tampa Bay Rays -135. 7/28/18: Los Angeles Angels -123. 7/23/18: My apologies for the late post (5:41 EST). It took me much longer than usual to find a good play. Lots of junk on today's card. I'm riding the Cardinals at +107 today. I'm not a big fan of betting on rookies but this guy looks like the real deal. The Reds are ice cold and missing Gennett as well. Luis Castillo has been inconsistent, Cards have owned Reds this year and Carpenter is on fire. 7/21/18: Arizona Diamondbacks -150. Godley has handled Rockies bats in his four career starts, Colorado will be missing leadoff hitter DJ LeMahieu with an oblique injury and AZ beats up left handers. 7/13/18: Minnesota Twins +1.5 (-165). 7/12/18: New York Yankees -118. The Yanks are 23-1 in Severino's last 24 starts as a favorite. Cleveland's been somewhat cold as of late, which is tough to put in print after their huge offensive outburst last night lol. 7/11/18: Los Angeles Angels -114. The Mariners are cooling off and the Halos are heating up. Marco Gonzales is a nice young pitcher but isn't the same on the road. Check this stat out... He's given up only 1 homer in 54 innings at home this season. He's allowed NINE on the road in only 53 innings! 7/10/18: Tampa Bay Rays -185. Other interesting tidbits include all six of Minnesota's hittes who have previous at bats vs. Royals starter Ian Kennedy have homered off him. The Cubs only have a .184 on base percentage vs. Johnny Cueto. 7/9/18: Pittsburgh Pirates +1.5 -160. 7/6/18: Los Angeles Dodgers -121. 7/5/18: Seattle Mariners -140. Angels have sucked mightily vs. LHP this season. They've also gone 3-7 over their last 10, while the Mariners have been red hot at 8-2. 7/4/18: Happy 4th of July! Let's make our own bang tonight with the White Sox/Reds OVER 10 runs. Two gas cans on the hill, PERFECT hitting conditions, both team's bats on fire! Doubling up on this one expecting an easy OVER here! 7/1/18: Passing. Most of today's games are early, not leaving enough time to properly sniff out value. Enjoy your Sunday! 6/30/18: Seattle Mariners -205. The Royals are 12-41 in their last 53 games vs. right-handed starters. Felix pitching much better in June and is always pitches better at home. 6/29/18: Toronto Blue Jays -200. 6/27/18: Philadelphia Phillies +127 and Detroit Tigers +121. 6/25/18: New York Mets on the runline +1.5 (-165 odds). 6/22/18: Los Angeles Dodgers/New York Mets UNDER 7.5. 6/19/18: Minnesota Twins run line +1.5 -105 odds. 6/18/18: White Sox/Indians UNDER 8.5. 6/16/18: Detroit Tigers/Chicago White Sox OVER 9.5. 6/13/18: Arizona Diamondbacks -155. This team is RED HOT and we're in the midst of a SWEET opportunity to cash in big over the next week tailing them. 6/12/18: Los Angeles Angels/Seattle Mariners UNDER 8. 6/11/18: Chicago Cubs/Milwaukee Brewers UNDER 8.5 runs. 6/8/18: What a horse-sh*t loss last night with ding dong Scott Servais bringing in Jesus Colume to face his former team up 5-1 in bottom of 9th and he promptly loads the bases. Then Servais continues to stick with him and gives up a bases clearning double. Make note: Servais is one of the worst game managers in baseball. I wonder if it crossed his mind to bring in the closer in a save situation? Idiot! Today's play is early action. Pittsburgh Pirates/Chicago Cubs UNDER 8 runs. 6/7/18: Dodgers at +105 and Mariners/Rays UNDER 8. 6/6/18: Colorado Rockies/Cincinnati Reds OVER 9. 6/5/18: Los Angeles Angels -190. 6/4/18: San Diego Padres -109. 5/31/18: Tampa Bay/Oakland UNDER 7.5 runs. 5/30/18: Tampa Bay Rays +127. 5/29/18: New York Yankees +106. 5/28/18: San Diego Padres -116. 5/21/18: New York Mets -130. 5/20/18: Boston Red Sox -205. 5/18/18: Padres/Pirates UNDER 7.5 runs. 5/16/18: SF Giants -154 (Harvey vs. Suarez). 5/13/18: Pittsburgh Pirates -154. 1:35PM EST start! 5/9/18: Seattle Mariners/Toronto Blue Jays OVER 9.5. 5/8/18: Detroit Tigers/Texas Rangers OVER 9.5 runs. 5/7/18: San Francisco Giants +100. 5/6/18: Kansas City Royals -145. 5/2/18: Miami Marlins run line +1.5 -120. 4/30/18: Reds runline +1.5 -155. 4/29/18: New York Yankees -110. 4/28/18: Brewers/Cubs UNDER 7 runs. 4/27/18: Detroit Tigers/Baltimore Orioles OVER 9.5. 4/26/18: Boston Red Sox -210. 4/22/18: Passing. Today's start times are very early and there's not enough time to properly handicap the card to determine where the best value lays. Plus, I need a fricken day off BAD! Back tomorrow! Enjoy the rest of your weekend! 4/21/18: New York Mets -155. 4/15/18: Arizona Diamondbacks +1.5 -119. 4/14/18: San Diego Padres -112. 4/13/18: Los Angeles Angels -155. 4/11/18: Los Angeles Angels -114. 4/10/18: Atlanta Braves +1.5 -110. 4/9/18: Pittsburgh Pirates/Chicago Cubs UNDER 7. 4/6/18: I've had a slow start so am taking the day off to assess teams. 4/5/18: Milwaukee Brewers +102. Fading the Cubs today who have scored 1 or less runs in 3 of their last 4 games. 4/3/18: Los Angeles Angels -133. 3/31/18: Chicago White Sox +101. 3/30/18: Milwaukee/San Diego UNDER 8. Managerial Changes Heading into the 2018 MLB Season - The 2018 baseball season is nearly upon us. And in today's age of rapid-turnover in all phases, it's time to start bringing ourselves around to speed. One area of concern are all the changes in leadership, with a half-dozen new managers around the league. It's really a mixed bag, with some teams looking to expedite their rebuilding process, as well as high-profile teams on the cusp looking for a little extra boost with some new leadership. In this article, Loot breaks down all the managerial changes in MLB, with bios on all the new faces. Check it out! World Series Game 1 Pick: Houston Astros +160. Note: We are done for the season as there are no advantages/edges to be had when good teams are playing each other this deep into the playoffs. Thursday, October 12th: Washington Nationals -105. Friday MLB Playoffs Picks: Houston Astros -175 and Cleveland Indians -230. Thursday ALDS Gm 1 Pick: Houston Astros -133. Tuesday AL Wildcard Pick: New York Yankees -250. Thursday, September 14th: Atlanta Braves +125. Wednesday, September 13th: Milwaukee Brewers -168. Tuesday, September 12th: Minnesota Twins -175. Monday, September 11th: No value; Passing. Saturday, September 9th: Arizona Diamondbacks -180. Friday, September 8th: Arizona D-Backs -240. Thursday, September 7th: Minnesota Twins -114. Wednesday, September 6th: Pittsburgh Pirates +118. Tuesday, September 5th: Colorado Rockies -169. Monday, September 4th: Milwaukee Brewers -135. Sunday, September 3rd: Seattle Mariners -141. Saturday, September 2nd: Minnesota Twins -150. Friday, September 1st: Arizona D-Backs -102. Thursday, August 31st: Milwaukee Brewers -131. Wednesday, August 30th: SD Padres -128. Tuesday, August 29th: Cards/Brewers UNDER 9. Monday, August 28th: Oakland A's/Los Angels Angels OVER 9.5. Sunday, August 27th: New York Mets/Washington Nationals GM2 UNDER 8.5 runs. Saturday, August 26th: Tampa Bay Rays +123. Friday, August 25th Prediction: Los Angeles Angels -106. Thursday, August 24th: There is no edge to be had on today's card so we're forced to pass. There is never a reason to force the action as there's always another game! Have a great day! Wednesday, August 23rd Play: Atlanta Braves +101. Tuesday, August 22nd: Cubbies/Reds OVER 10.5. Monday, August 21st: Pittsburgh Pirates +127. Saturday, August 19th: SF Giants -139. Friday, August 18th: Texas Rangers -208. Wednesday, August 16th: No value; Passing. Tuesday, August 15th: New York Yankees -147. Monday, August 14th: Miami Marlins -143. Sunday, August 13th: Detroit Tigers +115. Saturday, August 12th: Los Angeles Dodgers -241. Friday, August 11th: Washington Nationals -170. Thursday, August 10th: Indians/Rays UNDER 8. Wednesday, August 9th: Seattle Mariners -105. Monday: SD Padres/Cincinnati Reds OVER 9.5. Saturday, August 5th: Minnesota Twins +117. Friday, August 4th: New York Yankees +114. Wednesday, August 2nd: Baltimore Orioles -125. Tuesday, August 1st: Mets/Rockies UNDER 12.5. Monday, July 31st: Miami Marlins +121. Sunday, July 30th: Philadelphia Phillies -135. Saturday, July 29th: Miami Marlins -135. Friday, July 28th: Minnesota Twins -111. Thursday, July 27th: Today's short MLB card doesn't offer any value so we're forced to take a pass. Wednesday, July 26th: Arizona D-Backs -193. Note: Game goes off at 3:40PM EST. Monday, July 24th: Baltimore Orioles -102. Sunday, July 23rd: Philadelphia Phillies -110. Saturday, July 22nd: Philadelphia Phillies +105. Friday, July 21st: New York Yankees -122. Thursday, July 20th: San Francisco Giants -183. Tuesday, July 18th: Los Angeles Angels -133. Monday, July 17th: Minnesota Twins +100. Sunday, July 16th: Colorado Rockies +115. Saturday, July 15th: Seattle Mariners/Chicago White Sox UNDER 9.5. Friday, July 14th: Dodgers/Marlins UNDER 8.5. Monday, July 10th through Thursday, July 13th: All Star break. Sunday, July 9th: Chicago White Sox +107. Saturday, July 8th: Philadelphia Phillies -154. Friday, July 7th: St. Louis Cardinals -118. Thursday, July 6th: Baltimore Orioles +123. Wednesday, July 5th: Hou/Atl OVER 9.5. Tuesday, July 4th: Kansas City Royals +122. Monday, July 3rd: Texas Rangers +104. Sunday, July 2nd: Miami Marlins -129. Saturday, July 1st: St. Louis Cardinals -116. Friday, June 30th: Texas Rangers -132. Thursday, June 29th: San Diego Padres -117. Wednesday, June 28th: SD Padres -128. Tuesday, June 27th: Chicago White Sox +118. Monday, June 26th: Washington Nationals -152. Sunday, June 25th: Astros/M's OVER 10. Saturday, June 24th: Seattle Mariners +128. Friday, June 23rd: Arizona Diamondbacks -197. Thursday, June 22nd: Miami Marlins +120. Wednesday, June 21st: Chicago Cubs -190. Tuesday, June 20th: Chicago Cubs -195. Monday, June 19th: L.A. Dodgers -300. Sunday, June 18th: Arizona Diamondbacks -175. Saturday, June 17th: Colorado Rockies -160. Friday, June 16th: Milwaukee Brewers -160. Thursday, June 15th: Colorado Rockies -168. Tuesday, June 13th: Los Angeles Angels +112. Monday, June 12th: Texas Rangers +100. Sunday, June 11th: Milwaukee Brewers +132. Saturday, June 10th: SF Giants -140. Friday, June 9th: NY Mets/Atlanta Braves OVER 10 runs. Thursday, June 8th: Chicago Cubs -188. Wednesday, June 7th: Chicago White Sox +162. Tuesday, June 6th: Seattle Mariners -201. Monday, June 5th: San Francisco Giants -128. Sunday, June 4th: Seattle Mariners -128. Saturday, June 3rd: San Diego Padres -104. Friday, June 2nd: Philadelphia Phillies -117. Thursday, June 1st: Today's short card offers no value/edges so we are forced to pass. Wednesday, May 31st: Milwaukee Brewers/New York Mets UNDER 7.5 runs. Tuesday, May 30th: Astros/Twins OVER 9. Monday, May 29th: Houston Astros -115. Sunday, May 28th: Taking a much needed day off! Saturday, May 27th: Cincinnati Reds +114. Friday, May 26th: SF Giants -121. Thursday, May 25th: Padres/Mets OVER 8.5. Wednesday, May 24th: Los Angeles Angels -102. Tuesday, May 23rd: White Sox/D-Backs OVER 11 runs. Monday, May 22nd: NY Yankees -172. Sunday, May 21st: St. Louis Cardinals -175. Saturday, May 20th: LA Dodgers -175. Friday, May 19th: Pittsburgh Pirates -123. Thursday, May 18th: Oakland A's -105. Wednesday, May 17th: Detroit Tigers -147 and Oakland A's -101. Sunday, May 14th: Taking a much needed day off! Saturday, May 13th: KC Royals -118. Friday, May 12th: Chicago White Sox -127. Thursday, May 11th: Cincinnati Reds +105. Wednesday, May 10th: Milwaukee Brewers -123. Tuesday, May 9th: Padres +105 and Twins -105. Sunday, May 7th: Cleveland Indians -107. Friday, May 5th: Yankees/Cubbies UNDER 7.5 runs. Tuesday, May 2nd: Cincinnati Reds -131. Monday, May 1st: St. Louis Cardinals -154. Sunday, April 30th: Houston Astros -200. Saturday, April 29th: Atlanta Braves +108. Friday, April 28th: Tampa Bay Rays +120. Thursday, April 27th: No value; Passing. Wednesday, April 26th: Seattle Mariners -126. Tuesday, April 25th: Atlanta Braves +109. Monday, April 24th: Colorado Rockies -161. Sunday, April 23rd: Boston Red Sox +100. Saturday, April 22nd: Washington Nationals +103. Friday, April 21st: Washington Nationals +106. Wednesday, April 19th: O's/Reds UNDER 9 runs. Tuesday, April 18th: Arizona D-Backs -120. Monday, April 17th: Seattle Mariners -145. Opening Day Pick: San Francisco Giants -144.